Buyers Guide: How to Choose a Roof Top Tent? The vehicle you plan to use for your adventure is a key factor and will determine many of your options for roof top tents. It is the foundation of your trip, it will hold the tent and take you from a-b. So make sure you have a vehicle worthy of hitting the outdoors such as a Jeep, SUV, 4×4 or Pickup truck for example. These are robust and reliable motor vehicles that are fully compatible with roof racks, the 2nd most important thing when considering a roof top tent. You will need to make sure that your vehicle is indeed compatible with a roof rack or roof bars. If you’re looking at a roof top tent for the first time in 2018, then you’re in luck. Many of the companies mentioned in this list have taken measures to make their products available to substantially more models than in the past. 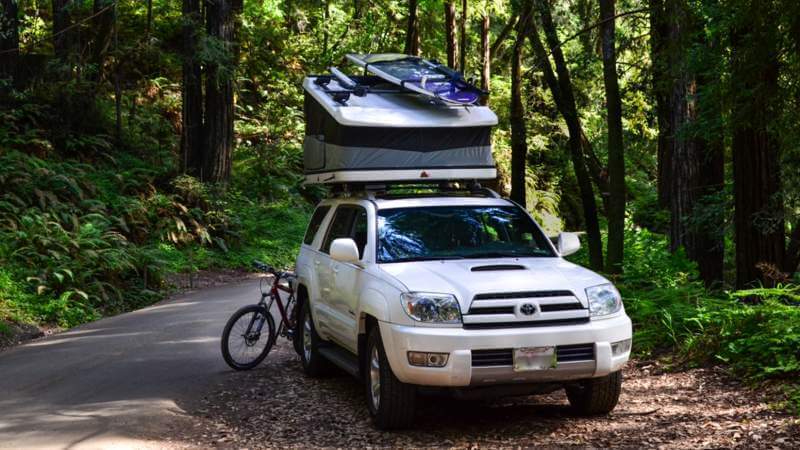 Previously they were restricted to only specific brands and models of cars, but now they have created Customizable and versatile roof racks than can be altered and adapted to fit most vehicles that are used for overlanding. A roof rack with a cross bar fitted is the most useful as most tents require some kind of parallel bar to latch and mount onto. An important figure to be aware of is the cars, roof racks and tents weight capacities. A top quality roof top tent with polyurethane base will have a weight capacity of around 500-650 pounds, supporting 2-3 people plus gear. The tents themselves usually weight between 100-160 pounds, so a roof rack that can withstand that weight is crucial. Lastly, what lies beneath all of this is your car, make sure you have a clear understanding of what kind of weight the vehicle can hold without too much pressure to the wheels and axles. The typical vehicles that are used for overlanding like Jeeps and Pickups generally do have a substantial weight capacity already, given the nature of their use. But check on this nonetheless. Consult our FAQ below to learn about static weight vs. dynamic weight, an important formula you should be aware of when roof top tent camping. Throughout our review process of numerous roof top tents, we have come to realize that they do mostly qualify as 4 season tents. This is excellent and proves their quality, so I would look out for whether or not the tent has been given the 4 season go ahead by either the company, our review or other user reviews. The only scenario where it wouldn’t be important is if you know for a fact you will never be encountering any snowfall, in which case a 3 seasons would suffice, as they are all waterproof with substantial HH ratings. The vast majority of roof top tents are aluminum in frame. An anodized aluminum is commonly seen in the top quality tents, this is evident when you look at our list. The hard shell tents however usually consist of a fiberglass shell to provide a lighter, more aerodynamic approach to their design. One feature that is worth keeping an eye out for is steel hinges. An aluminum framework with stainless steel hinges will give the tent much longer longevity and help to reinforce the weak and vulnerable areas of the folding mechanism. Important for extensive use and constant moving. A poly/cotton combination should generally be used on for the tent canvas and sidewalls. You may see some difference in the roof if they have some reinforced area, but generally speaking for sidewalls and surrounding areas, poly and cotton RipStop is the industry standard. As for the base, we would like to see a polyurethane base, perhaps mixed with aluminum or steel for the optimal strength. This also leads to strong and reliable weight capacity for the tent base. Roof top tents are not the most breathable tents out there, given they are so rugged and durable, they do falter somewhat in this department. However, we can assist the circulation with doors and windows, so this is key to try and have at least 1 window and of course they all should have 1 door. You can look out for a larger D shaped door for optimal circulation. Additionally a meshed door and window would be better, as this will also stop bugs and insects popping into your tent to annoy you. Most models should have an integrated mesh on all of their window and door panels. Not a necessity by any means and some brands have no manufactured an annex or awning to go with their tents. However, many brands indeed have and it is a very viable add on for your roof top tent. Generally between $200-$250 for a compatible annex, they will be designed to match and fit with their own brand and model. They are a good idea in our opinion if you have the means to use one. Consisting of the same quality as their tent, they utilize RipStop fabric, fully waterproof and offer a greater area to shelter from the elements. Awning can also be used to create that extra shaded area away from the hot summer rays. As you can see from our list there are quite a few different styles to consider when choosing a roof top tent. The Tepui, Yakima, ARB all follow a very similar design shape, a wide, spacious tent that has attachable annexes and can fit parallel or side on to the roof rack. Whereas the Gobi Desert and Freespirit models have a compact design and fit one way on the rack, these do not overhang and do not have annex attachments. Lastly is the hard shell version which is suitable for smaller vehicles, even cars. They mount onto the roof rack like a large rectangular box and literally pop up vertically to present a large spacious box room that is quite long. You may feel more at home with the traditional tent aesthetic of the Tepui and ARB models, or you may prefer the unique design and modern look of the other others, it comes down to personal preference. It is important to make sure your tent comes with a protective travel cover. The tents can protect themselves once pitched, with their quality materials. However, when you are on the move and it’s packed down, it will need some help. Most models do come with a travel cover, but ideally you would want a heavy duty PVC travel cover, to really alleviate any concern of weather damage while on the road. A heavy duty tarp may also work well if it has a high HH rating. A small feature and we may be pulling hairs at this point, but if you are really stuck between choosing 2 tents. Consider the aerodynamic values of the tent when it’s packed down. A tent with a better aerodynamic design will offer better miles to the gallon as opposed to a large square block sitting on the roof rack. An unfortunate yet natural occurrence that happens when transporting large, engineered products is shipping damage. Given that when the tent arrives for the first time, there will be a lot of bags of nuts and bolts, parts, pieces, bars etc. etc. It’s imperative that you give the whole thing a once over, to check for missing parts and faulty parts. Unfortunately during the mass production of thousands of these tents, it is possible that occasionally a piece is defect or missing. More importantly make sure you are covered and have a warranty for shipping and at least for the first year of use, if possible. Just to give you that protection from the get go. Remember it is a good idea to check it all through thoroughly once and set it up at home before going. We hope this helps you in choosing your next roof top tent. If you’re in need of more information on this unique tents, then check out our roof top tent camping tips and also our comparison article comparing them to ground tents and trailers. Share if this was useful, or comment with your own experiences, we would love to hear from you.